The sponsorship by Tommy Hilfiger of my latest book project FASHION ETCETERA (published in two editions) has led to some confusion in the press and on line. Hopefully this post will serve as a clarifying point of reference for future articles. In November 2006 I had, what was in essence, my first retrospective show at the National Portrait Gallery in Canberra Australia (where we now live). In that exhibition, which had no catalogue, I showed most of the images as spreads. The success of that project enthused me to create a book along the same lines. This together with a recent immersion in fashion related work, led to FASHION ETCETERA. I was well underway with this project/archive exploration - with the assistance of my son and grandson - when the news got out and I was approached by fashion houses to participate in a sponsorship deal. In the event I was very pleased to accept an offer of sponsored exhibitions and the co-publishing of a special edition of FASHION ETCETERA from Tommy Hilfiger. The Hilfiger in-house graphic designer Yuthi Meas is responsible for the cover of the special edition but the rest of the creative project is my usual in-house production. I enjoy the freedom of doing everything - creative concept, art direction, photography, editing, scanning, image retouching, design and book construction - in my studio. I also supervised proofing, pre-press and personally tweaked the colour balances as the pages rolled off the presses in Hong Kong. 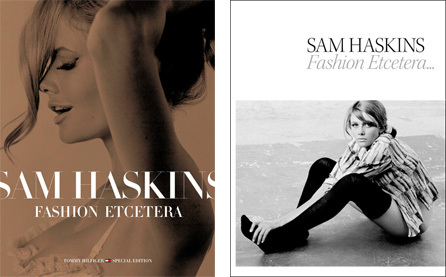 The two editions of FASHION ETCETERA are technically identical apart from the covers. The author's edition has a gloss laminate French fold jacket on a black cloth finish hard cover. The special edition has a gloss laminate print on the boards and a translucent slip case with silk screened white lettering. Recommended Retail Prices on the two editions are $67.50 and $100.00 respectively. The special edition will be for sale at Tommy Hilfiger stores globally from September 2009 and the author's edition will be for sale at select bookstores and online from October 2009. Of course both books will be for sale at the exhibition in New York from September 17th 2009 and exceptionally, starting the same day, Dashwood Books at 33 Bond Street in New York will carry the author's edition. Tommy Hilfiger will also launch a small range of fashion items, T-shirts, a scarf and tote bag based on an image from the era of my first book, Five Girls. This is a fun bonus to what promises to be an exciting show at Milk Gallery in New York, opening to the public on September 17th, 2009 and running through to October 24th. The capsule range from Tommy Hilfiger featuring the Gill with Curl image will be for sale at the exhibition and at Tommy Hilfiger stores globally from September 2009. I'll be in New York for the opening and a book signing is planned for the following weekend. There will also be an evening presentation at Strand books during that period. A master class is planned at Milk and portfolio reviews (by appointment) for students. Please write to masterclass@haskins.com for details of master classes and portfolio review. Also keep an eye on this blog as we post more information about events at Milk in the coming weeks. This entry was posted on Saturday, June 13th, 2009 at 9:30 am	and is filed under Books, Exhibitions, Press Article. You can follow any responses to this entry through the RSS 2.0 feed. Responses are currently closed, but you can trackback from your own site.